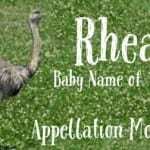 It’s a mythological name with the same ending as current favorites. 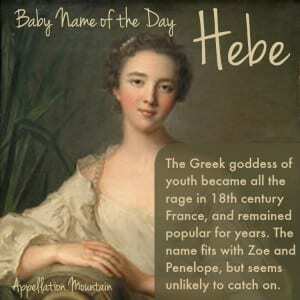 Thanks to Sarah for suggesting Hebe as our Baby Name of the Day. The goddess Hebe is the daughter of Hera, and her dad is usually listed as Zeus. Despite her parents’ high rank, her tasks can appear menial. She serves as the cupbearer, bringing nectar and ambrosia to all of the gods. And she helps her mother into her chariot. When the Olympians were re-invented as as Marvel Comics characters, Hebe put down her cup to serve as Hera’s secretary. Hebe’s powers were significant. She’s the goddess of youth, able to bestow eternal youth on others. She’s sometimes depicted as an eagle, a bird the Greeks believed had phoenix-like powers of regeneration. She was also associated with forgiveness. 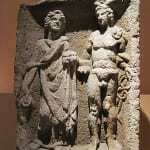 The goddess eventually married Heracles, but compared to the average Olympian, the stories about her are low key. Centuries later, Hera’s quiet daughter became quite fashionable. The trend may have started in France, where aristocratic women were depicted as Hebe in their portraits as early as the 1730s. Before she became queen, Marie Antoinette was painted the white flowing dress of the goddess – “en Hébé”- in 1773. Not long after, the French Navy applied the name to a class of ships. The trend spread to England and throughout Europe, eventually reaching America. Sculptures are common, too, and many remain in museums and public spaces. Despite the fashion in France for depicting women as the goddess, it’s not known as a name in France today. 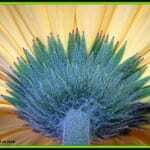 It is known as a genus of plants native to New Zealand and neighboring areas, as far away as South America. 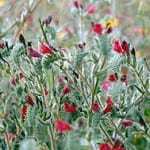 They range from small flowering shrubs to trees, and they gave their name to the Hebe Society, established in the 1980s to support native plants in New Zealand. It’s the name of a minor character in Gilbert & Sullivan’s wildly popular comic opera, H.M.S. Pinafore. In the US, heebie-jeebies is slang for a sort of nervous anxiety. You might also say “this place puts me on edge.” It probably comes from a 1920s-era cartoon, but it caught on quickly and is heard throughout the English-speaking world. It’s not quite a negative, and today the language is dated. But it’s widely known, and I suspect that it would make many parents pause before choosing this sound-alike name for a daughter. Another reason to hesitate? Pronounced heeb, it’s a derogatory term for a person of the Jewish faith, from Hebrew. Despite the drawbacks, the name has been heard in recent years. As of 2014, fourteen newborns were named Hebe – a new high. Doubtless that’s because American parents have fallen hard for Greek names ending in e. The current US Top 100 includes Chloe and Khloe (#18 and #88), Zoey and Zoe (#22 and #32), and Penelope (#42), with Phoebe and Daphne also catching on. It helps that the goddess is associated with youth, has no gory stories attached to her name, and is associated with so many lovely works of art. It would take a daring namer to claim this choice for a daughter today. What do you think of Hebe? Is it wearable? Non-American readers, I’d be especially curious to hear from you on this one! I didn’t realise Hebe was a goddess, because I only know the plant. The name would be pretty wearable in NZ, it wouldn’t get shortened to Heeb much and noone would know that was a US taboo word anyway. 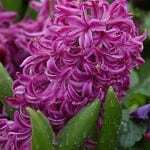 Hebe would be an interesting option if you wanted to honour a Heather too, but with a fresher feel, since they are similar, purple flowering plants. I can’t picture it due to the slur, but Ivie or Ebie, sure. Like Virginia said, it’s pronounced Ivi in Greek. There’s a popular singer right now named Ivi Adamou. I was considering it for a middle, but my husband didn’t like it because Ivi is also the name of a prominent soda brand in Greece. I love the meaning of Ivi/Hebe though, especially for a new baby. It’s ‘Ηβη (pronounced EE-vee) in Greek. The English spelling and pronunciation kind of ruins the name. The name has a nice history, besides the more modern associations, of course. However, I would not use it for my own daughter. I think I would choose Zoe or Penelope first. I know a little girl named Phoebe, which I had thought was rather uncommon, but now I think it is really cute! It is a more wearable alternative to Hebe, in my opinion. I don’t think I’d ever use this name due to the same reasons you’ve listed (heebie-jeebies and a slur derived from Hebrew), but I would love for someone to tell me I’m wrong and that the name is usable. I find it very appealing. I had never considered if for a name before but is it crazy I kind of love it? Great stories behind the name and–again am I crazy?–a wearable sound. Heeb does worry me though, as I think that would be a natural nn. I’m a New Zealander so all I can think of is the Hebe plants when I hear this name. Still, they’re quite cute wee plants.